A few years ago I started seeing a new stone at Tucson. It was a pale, semi-translucent gemstone with flecks of black. Back then, only a couple of Chinese suppliers had the rough, and though the price was pretty high, the actual quality of the stone was not top-notch. Three years later, the market has firmed up for this jewel-toned stone. Prehnite is found in Australia, China, Scotland, S. Africa and the US. It ranges in color from pale yellow and brown to a desirable pale green, and may include black rutilations. The best quality stones are free from rutilation and exhibit an almost edible green that is semi-transparent. It was named after a Dutch Colonel. Over the past several yeaars, supplies have improved in both quantity and quality. Nice prehnite is still more expensive than common stones like amethyst or other quartzes, but it is definitely affordable. 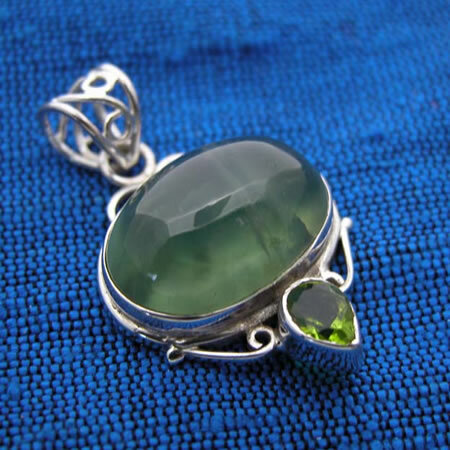 Prehnite is said to strengthen the life force and increase energy levels. Click here to see our selection of this lovely stone. Kyanite is a semi-translucent stone with mixed veins of transparency and opaqueness. Most of current supply comes from Brazil, with processing done in India and in China. 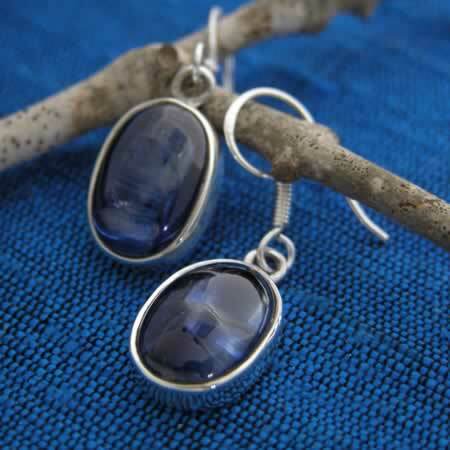 Kyanite is Greek for the color blue. It ranges from blue to colorless. The most popular colors on the market today are dark blue (shown) and blue green. It is a difficult stone to cut because of variable hardness and cleavage, but the end-result is worth the effort. This stone has a kind of luminescence similar to cats eye or labradorite when seen at an angle. Good quality kyanite is much cheaper than it was a few years ago, but like prehnite it is a step up in price from more common semiprecious stones. People are drawn to the intensity of color and shimmer of the stone. Kyanite is said to bring loyalty, honesty and tranquility, and to diminish anger and confusion. We have a few styles in this unusual and alluring stone that you can see here.